What three materials from the environment does a plant use to make food? the cause of global warming. the cause of acid rain. gets sunlight 24 hours a day. What is a source of energy for Earth's living things? What are three traits that determine the type of water biome? water, sunlight, and special care. water, sunlight, and carbon dioxide. The plants will with lots of sunlight. Which statement best describes the amount of sunlight that reaches the abyssopelagic zone? Sunlight does not reach the zone. Sunlight reaches only the top of the zone. Sunlight reaches throughout the entire zone. The poles receive lots of direct sunlight, whereas the equator receives very little sunlight. Earth’s tilt and revolution around the Sun affects the amount of direct that Earth receives in a single day and throughout the year. What do plants do when they need warmth/light? This zone contains little to no sunlight. Name 3 things most seeds need in order to grow and reproduce. 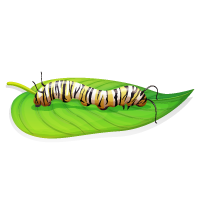 A caterpillar crawls on a leaf. The caterpillar is an animal. The leaf is a plant. What do both the caterpillar and leaf need to live? What do seeds need to develop into a new plant?